photography and then introduce you to who is our latest entry into our (LWB) Little White Book under the tab Spectacular Photographers! However, I think the photos speak louder than any words I could dream up, even with the use of a Thesaurus! 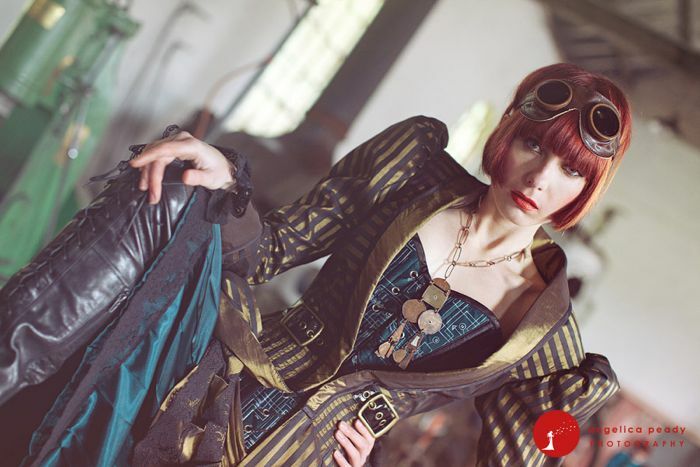 I fell in love with the Steampunk Wedding the moment I discovered it only a month ago and have been keen to show you a spectacular example of what your wedding could be like using this theme. It was when I stumbled upon Angie’s website that I got so (I will admit) over-excited about blogging about it. 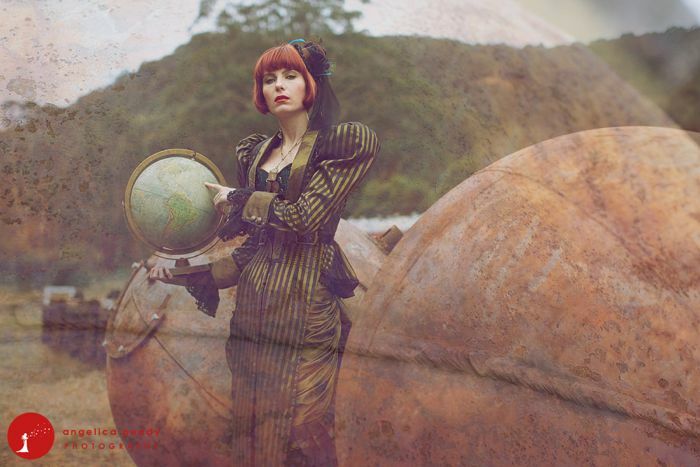 I love the imagery a Steampunk Wedding conjures up and Angies shoot just made me drool! May I introduce you to a fellow Aussie, a photographer who I believe effortlessly creates evocative images, Angelica Peady. Now, you can get creative photographers who tell great stories through their images and others who have superb imagery; composition, lighting and colours however, Angelica Peady is one of the rarities who does both! Her images captivate the essence of what her subject is. 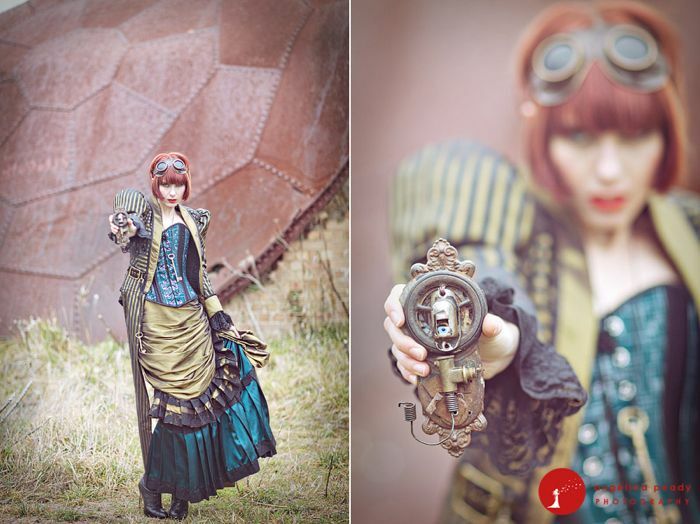 Steampunk – could this be your wedding theme? Some photographers may have been too cautious to place the model in front of such a colourful and textural background as in the above photos but in fact, I think it compliments the models outfit and actually draws your eye to the detail a lot more. This next photo is the shot that started off my every-so-unladylike-drool session! I love corsets and lace and all things Boudior. The corset, the lace, the regency stripe coat, the buttons on the coat all simply stunning details! (Oh dear, words are becoming a little difficult, I just keep drooling). Oooh this is one of my favourite images. I love the regency stripe in the coat against the hard, metal of the steam train. It makes the coat soft, sensual and shows it off; not too much, not too little. 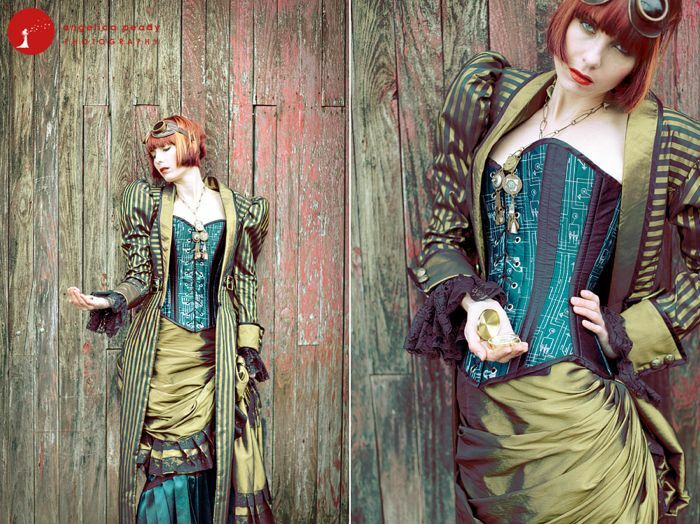 The model’s pose is strong, dedicated and of course that corset, that corset!!! 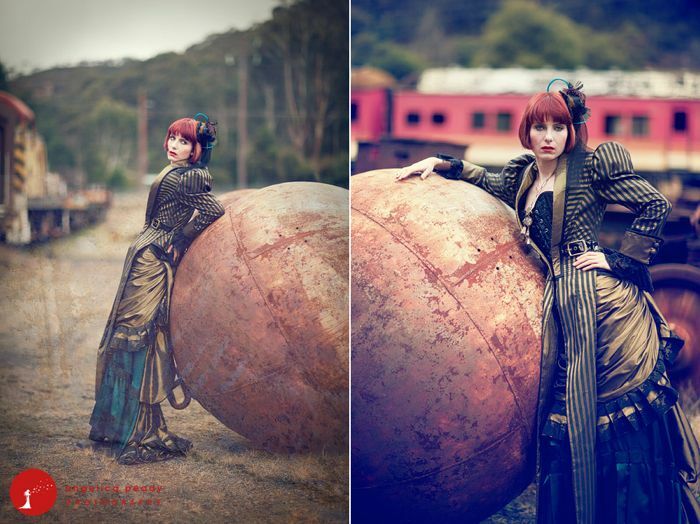 What would you do for your Steampunk Wedding ? 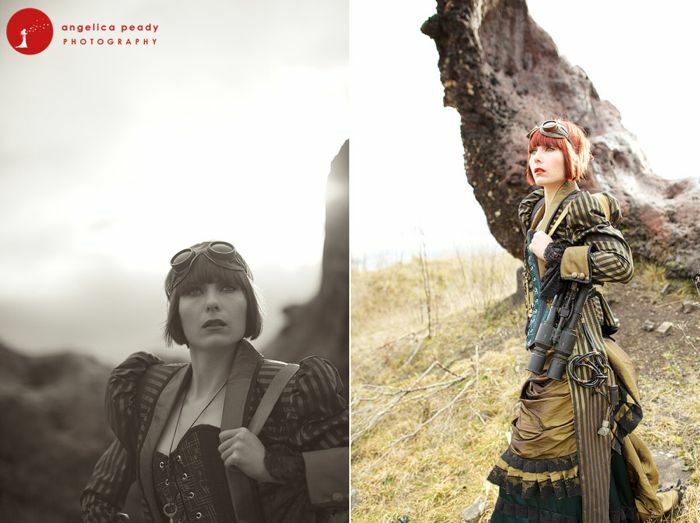 This photo shoot was created as a Steampunk Wedding themed Bridal Shoot and Angie’s got it spot on in my opinion. The clothes, the accessories, the environment, the lighting, and especially the colour! I love nothing better than having a nosey through Photographers websites, there is so much talent to be found but Angie’s pictures have an essence of imagery that only a creative eye can capture. The composition in each photograph is what makes them all stand out shots. 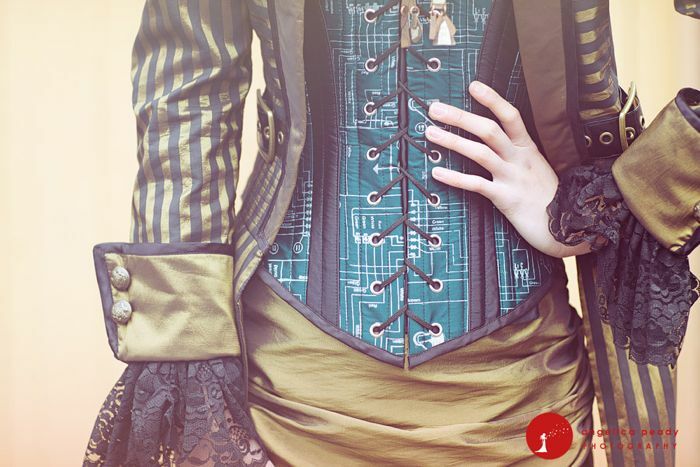 I love photos that capture your imagination through only showing ‘part’ of it’s subject too, like the photo at the top of the post of just the corset. This is the type of shot you should consider on your wedding day, take inspiration from Angie’s photos – just you, in your corset or lingerie from hips to bust – gorgeous! Explore the sexyness that you’ll feel being a bride on the day; become the modern day Alice and get a bit raunchy! 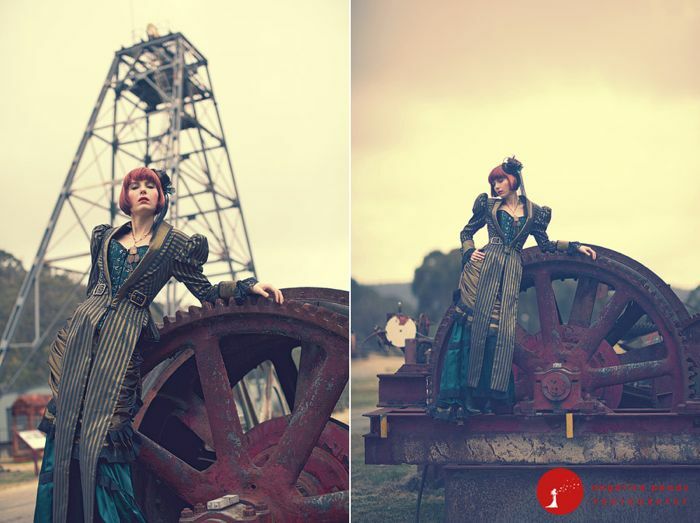 It is photo shoots like these and exceptionally talented photographers like Angie that are helping break tradition and give you the possibility of a whole new world when it comes to your Steampunk Wedding photos! Check out those boots!!! 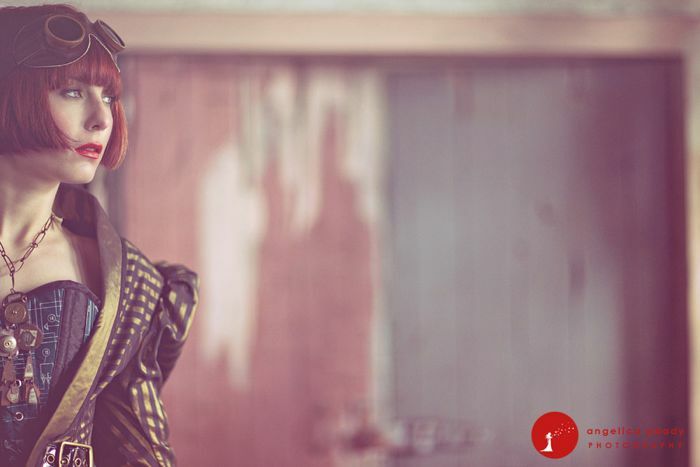 I am really proud to bring you this post and I am proud to showcase another stunning photographer like Angie Peady. Check out her blog for her wonderful ramblings. Alright, so now it’s your turn to fess up. 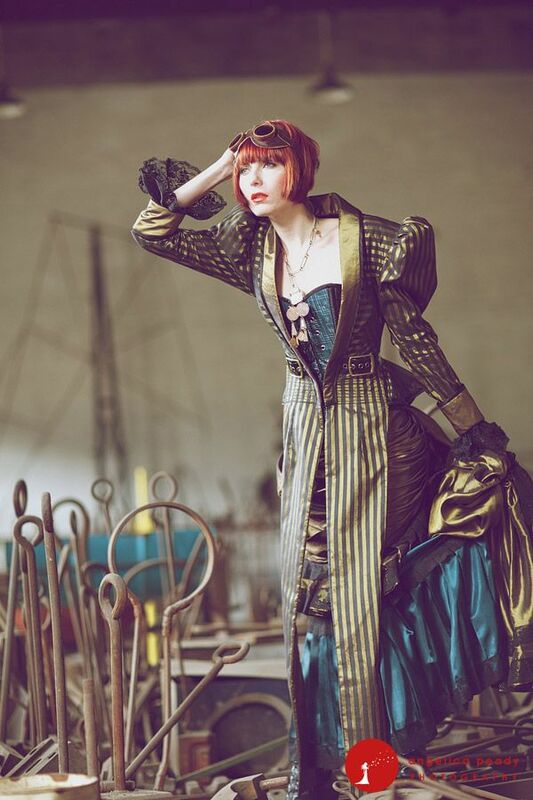 Would you do a Steampunk Wedding or maybe take elements of it? Which elements would you use? Show me your hands ladies! Thanks for sharing this and the jewelry! I love cameos and love them even more with this style, so beautiful.